One of the bests gifts I’ve ever gotten was a small suitcase full of 3×5 cards in a country where it’s hard to find the ones I like. These are like socks, we all need them but they’re not on anybody’s list. We’re usually picky in this area, so just do some snooping to see what paper your writer uses. As with noteboks you can leave little notes in the pages to come, we love those. Blank pages are that “gift that keeps on giving…” More cynically, they’re a great last minute gift that doesn’t look like one! You can’t buy inspiration, the muse doesn’t honor gift certificates, but you can give the gift of a writing space that invites inspiration. Like leaving out cookies and carrots for Santa and his reindeer, there are things you can do to welcome the muse. On no budget that could just mean surprising your writer by cleaning her/his desk. Buy a plant or a new lamp. Working with a little more cash? Have your local locksmith put a lock on the study door; maybe upgrade the desk or chair. You could even remodel the study, rent your writer an office, or build a writer’s shed like Roald Dahl or JK Rowling. For the obstinate procrastinator put a lock on the outside of that shed’s door like Dylan Thomas’ wife put on his. Special thanks to my friend Cheyne Kohl– Producer behind Underground Tracks, in Busan, South Korea–for this suggestion. Get away, whether it’s for a week in the country, a year in Thailand or just a day at home with your phones switched off . Give your writer’s inner child the gift of flight. Brookstone carries a range of indoor remote control helicopters. This is the ultimate desk toy. Make believe rescue missions and special ops raids are a great way to clear your head and keep your office safe. The battery lasts about as long as a coffee break; write while you recharge. Microsoft Word is the Huffy bike from Wal-Mart of word processors; it’s a fine place to start, but you need to upgrade when you’re ready for long distance. Some writers may be organized enough to write an entire novel in a single word document; I don’t know those writers. For screenwriters and playwrights, the industry standard is the very expensive* and very worth it Final Draft 9. FD9 formats your screenplay as you type, has space to plot every aspect of your story and character arcs, and even virtual index cards for step-outlining that are integrated with the script. It’s all a bit daunting at first if you came up on Word, but there are a lot of how-to videos to help get your bearings, and once you do, it’s a dream to write with. For me, the best part is Courier Final Draft, the paragon of fonts. In a promo for FD9, Entourage creator Doug Ellin said before Final Draft, his work was a mess. FD9 does have a novel template, but it’s less than worthless. I tried drafting with it for a few weeks and went back to Scrivener after one too many indentation debacles. 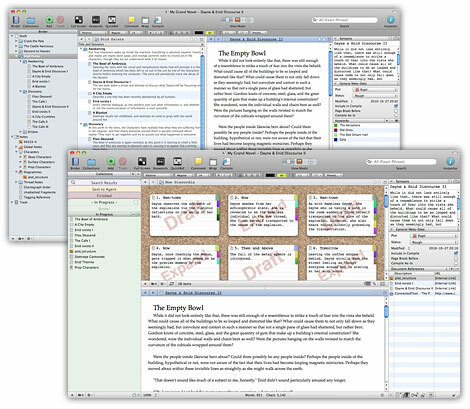 Scrivener is the real deal for real novelists, and an affordable alternative ($45) to Final Draft 9 for screenwriters. As with Final Draft 9, the learning curve is steep. After nine happy months on Scrivener, there are still buttons I dare not press. I use what works for me, ignore the rest, and keep tapping away. Scrivener has index cards too, and ‘cork boards’ for outlining. There are daily word count targets, based on your deadline and what days of the week you write (all 7 if you’ve been learning anything from this blog.) Scrivener is for big projects and all the notes, outlines, character sketches and miscellany they entail. It has space for illustrations and maps of your story world. There’s a template for multi-part novels–Anna Karenina could’ve fit neatly into Scrivener’s Russian doll of folders. The program works just as well for non-fiction as Tim Ferriss(also a pour over coffee guy) will attest. When you’re project is complete, Scrivener lets you compile your work into a variety of manuscript and ebook formats. If you’re working on a Mac, both of these programs allow you to work in fullscreen, a big help at blocking out distractions. *As software goes, it’s not that bad. Alternatively a simple egg timer, but the hour glass has more luddite appeal and looks more imperious atop a stack of manuscript pages. The Christmas classic Love Actually closes on the Beach Boys tune ‘God only knows where I’d be without you.’ That’s the song I would dedicate to the Freedom app. Writing isn’t a gear-heavy pursuit. So far on this list I’ve recommended special pens and notebooks, but none of that is really necessary to the writer the way a painter or musician needs certain equipment. Even if a writer uses a gold fountain pen in handmade French notebooks, and does her typing on Apple everything she won’t come close to the overhead of other arts. Therefore, writers should get a little leeway when it comes to gear shopping. When I brainstormed this list with some writer friends and their significant others, the one item that came up more than any other for a writer’s Christmas is the typewriter. If nothing else, a typewriter works as a decoration and symbol of the craft. It’s an epic gift even if it never comes off the shelf. That same bulk and robustness that makes a typewriter a great bookend also make it a reliable writing machine even after decades of use. You can still do all your writing on a typewriter, many writers do. This blog started as a series of interviews I drafted on an orange typewriter (above) with a French ‘AZERTY’ keyboard. There’s something about the commitment to punching each key, and the laborious retyping that brings out quality; those interviews wouldn’t have been the same on a computer screen. Typewriters are actually better for typing envelopes and filling out forms–as seen on the Wire. Give the writer in your life a typewriter and he he might type you the sole copy of a love letter or short story, complete with XXXXXX corrections and charming typos. Built to last, most typewriters from the last century are still around. If you don’t care about the condition of the machine, or you want one that shows its age, start your search in grandma’s attic, the local antique store, or Ebay. Typewriters tend to be undervalued, sellers rarely know what they have. I found a pre-WWII Underwood portable, with its original case and owner’s manual, for $75 at an antique store in San Diego. A new ribbon and a few squirts of WD40 had it working like new. For a typewriter you intend to use in lieu of a computer, or to find a specific model, check out mytpewriter.com. They do restored machines from every decade that cost about as much as a laptop but work like they’re fresh out of the box. Mytypewriter.com lets you shop by author, from Faulkner’s Remington to Joan Didion’s Royal KKM. Leonard Cohen wrote ‘so long Marianne’ on an Olivetti 22, FYI. Got any friends or family behind bars? Typewriters are ideal for the wordsmithing prison inmate on your list. New Jersey Based, Swintec makes electric typewriters with transparent bodies for just that purpose, check with your prison commissary for ordering details. The Lamy Safari is the perfect first fountain pen, and a great everyday jotter for someone who already has something more expensive. It’s cheap (about $22,) it writes beautifully and is built to last. Honorable mention in the writing instruments category goes to the Kawako Classic Sport. It’s around the same price and I hear good things. Say the writer on your list has been really good this year and you’re tempted to go all out and spring for a Mont Blanc, don’t. Instead, may I recommend the Sailor 1911 (AKA the ‘Sailor Profit’ in Japan.) Its design is based on the MB, some would say copied; but, alas, copyrights weren’t what they are now… Like Japanese cars and watches, Japanese pens more than make up in design and quality what they lack in pedigree and national reputation. You get a better pen at a better price. I bought mine in Japan–where they’re cheaper still–and I haven’t put it out of reach since loaded the first cartridge. This is my pen for life. The hosts of the Scriptnotes podcast–a huge influence on this blog we’ll get into another time–have created Writer Emergency cards to rescue blocked writers. Writer Emergency is a deck of prompts designed help the writer move on in his or her story or just play with a scene that isn’t working. 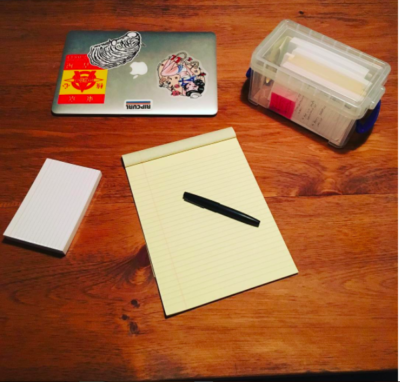 The cards began as a Kickstarter project with a ‘get one give one’ mission: for every pack delivered to backers, the guys at Scriptnotes will donate a pack to a youth writing program. Unfortunately, the Kickstarter drive was a little too successful and there is a waiting list for Writer Emergency. Just leave your email at writeremergency.com to be notified when they become available.